Dauley Design, run by Wallington Mum Alexandria Dauley, is a London based interior design practice, offering affordable design solutions that take a new, fresh approach to existing spaces therefore allowing clients to realise the true potential of their home by creating schemes that offer both beauty and practicality. Turning a house into a home can be a daunting task. 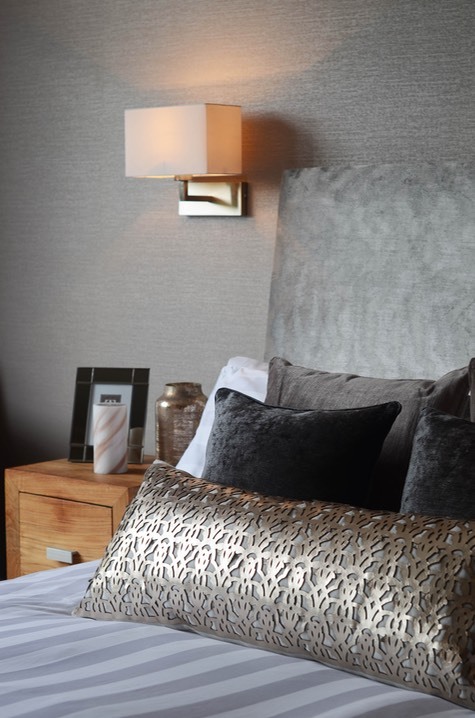 Blending space, light, colour and key features together to achieve a cohesive scheme can be challenging. Dauley Design works collaboratively with clients carefully incorporating their tastes and most loved possessions into a seamless design plan that offers both warmth and functionality in key living spaces. 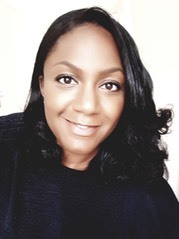 From concept to finished article Dauley Designs takes a hands-on approach, project co- ordinating the entire design process from developing the initial concepts through to selecting paint colours, window and floor coverings, furniture, art work and decorative objects. Dauley Designs creates a blueprint that links key rooms together, while making each room a feature in its own right. 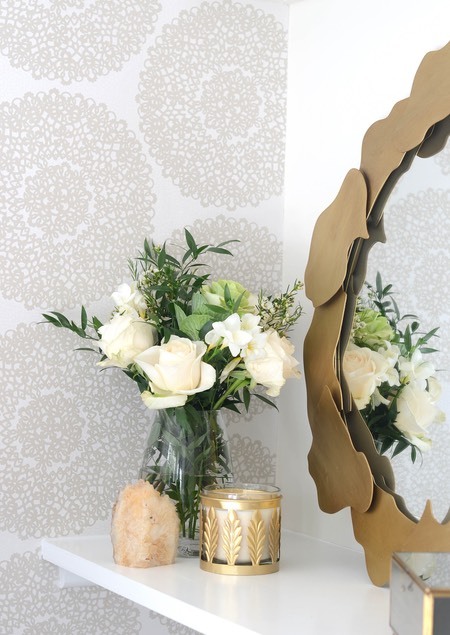 Our resident local Interior Designer, Alexandria Dauley of�Dauley Design�is offering a special offer on her “Online Design Service” product. 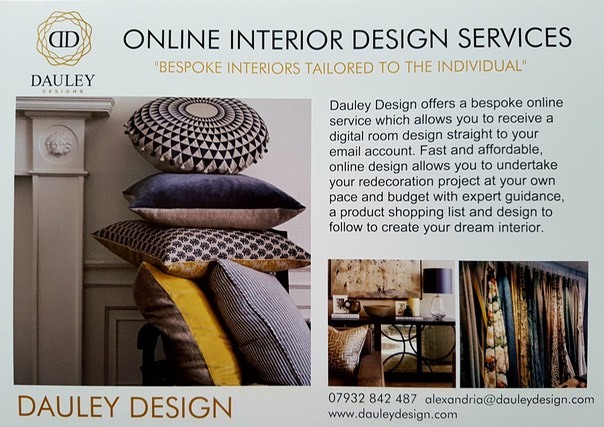 Alongside the traditional project co-ordinated design service Dauley Design offer a bespoke Online Service which allows you to receive a digital design straight to your email account. Fast and affordable, online design allows you to undertake your project at your own pace and budget but with expert guidance, a product source directory and design to follow. 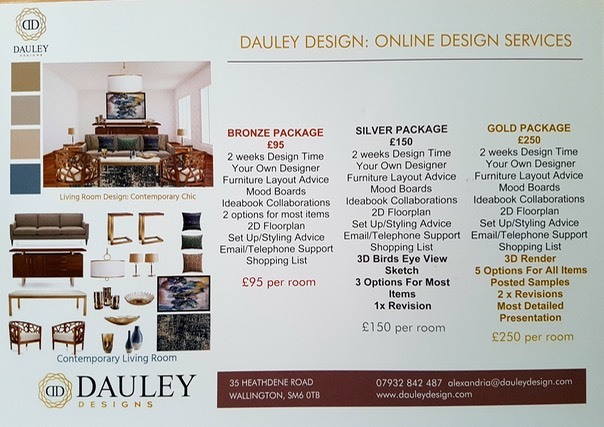 For more information on this offer or any other Interior Design enquiries please contact Alexandria at Dauley Design. 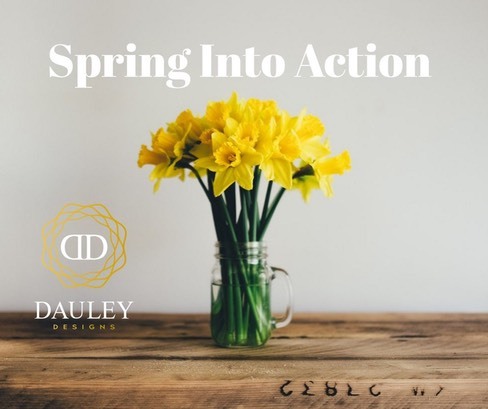 Spring is just around the corner and is the Number One season to start a home renovation project or tackle some re decoration. 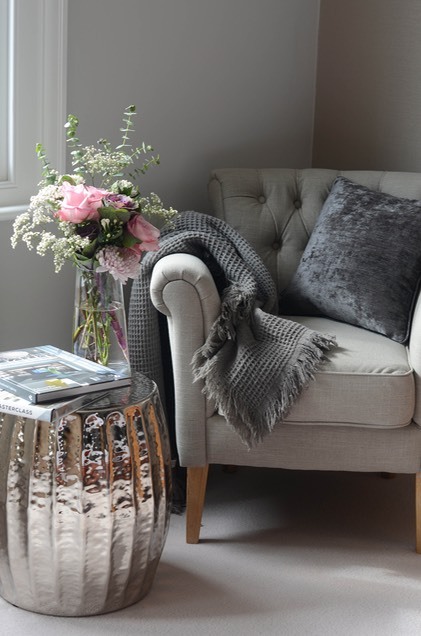 Start thinking about refreshing your interiors with an up to date redesign, new colour scheme and accessories, replace dated kitchens and bathrooms to add not only a pleasing aesthetic but also value to your home. Open up the dining room or kitchen to the garden to make the most of the warmer months ahead and consider starting that loft conversion you have been thinking about. Spring is all about new beginnings. Start planning your renovations today and contact me for all the help and guidance you will need along the way to produce a gorgeous finished home. Hi everyone, due to increased interest I am re launching my Online Design Services. So many people want a wonderfully designed home and would love to use an Interior Designer but feel this is unaffordable. I am offering a bespoke Online Service which allows you to receive a digital design straight to your email account. Fast and affordable, online design allows you to undertake your project at your own pace and budget but with expert guidance, a product shopping list and design to follow. This is why my Online Design Services are so great. With 3 affordable packages to choose from starting at �95 you can have a professionally designed room at a price you can afford. Start adding ideas to online ideas books using Pinterest or Houzz to show us your personal style and taste. and chat about the wonderful world of interiors! Simply click here to book your service and complete the Online Design Questionnaire and you are 2 weeks away from a beautifully designed space.